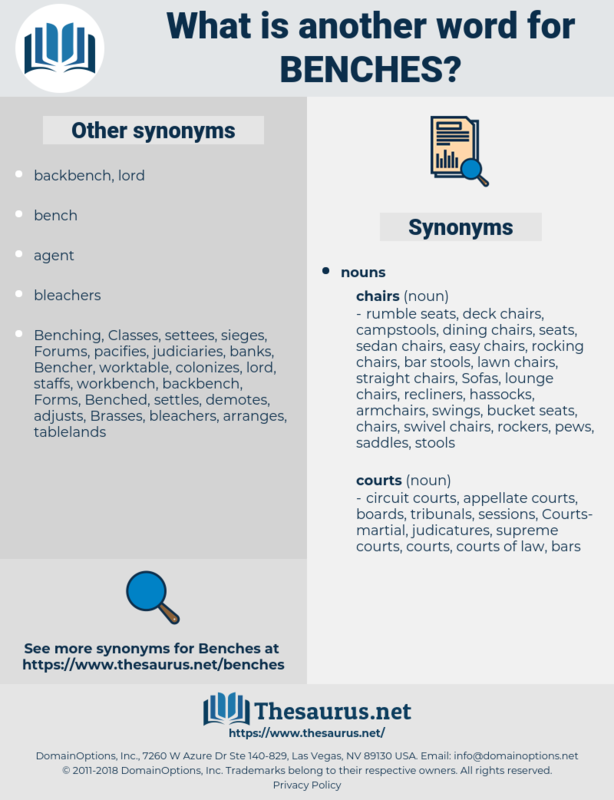 What is another word for Benches? chamber, chambers, accommodations, chambres, Branches, magistrates, judges, Beds, headquarters, embankments, bedrooms, Constituencies, tribunals, established, place-names, corners, judiciaries, courthouses, panels, captains, quarters, sidelines, chassis, shrines, classrooms, Academies, Patches, sections, precincts, Vacancies, placements, aggregations, Storerooms, destinations, seats, terraces, locations, spheres, colleges, departments, Houses, workings, districts, sub-offices, cinemas, tubes, boards, Gymnasiums, tiers, lounges, segments, Geographies, postings, speakers, sights, circles, parlours, Stations, antennas, halls, localities, Schools, circuits, bankers, hotspots, sectors, ateliers, bars, suites, sides, rooms, grounds, Workshops, stocks, NODES, offices, stalls, mandates, Footpaths, queues, venues, saddles, princes, rows, banks, rankings, Locales, Journals, streets, ranges, swathes, rulers, sites, campuses, blocks, parts, Entries, strands, stands, spaces, sieges, Islands, shops, walks, dishes, polls, aerials, PODS, places, pits, wards, Studios, ranks, Bases, spots, Ticks, drifts, SHOALS, swarms, vaults. 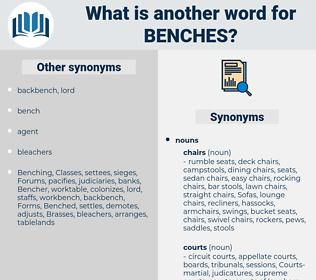 bleachers, courtrooms, courts, justices, divisions, chairs, camera, desks, stools. The seats were made of boards set on most anything that would hold them, with a few garden benches for reserved seats at the front. The floor of the room was brick, the table plain boards, and the seats were benches; not much luxury.